The following are guidelines recommended by Best Friends for trapping community (free-roaming stray or feral) cats. These instructions assume that trappers are using traps from the Tomahawk Live Trap Company (www.feralcat.com/traps). Specifics regarding the traps may be slightly different if you are using another type of trap. If possible, get the cats used to being fed at the same place and time of day. Don’t feed the cats the day or night before you are going to trap, so the cats will be hungry. Be sure to notify others who feed the cats not to leave food out. You want the cat to be in the trap a minimum amount of time before surgery, so trapping the night before is usually the best approach. Cats should not eat after midnight the night before surgery. Prepare the area where you will be holding the cats before and after surgery. A garage or other sheltered, warm, protected area is best. Lay down newspapers or absorbent material to catch the inevitable stool, urine and food residue. If there are young kittens involved, they should not be weaned from their mother before six weeks of age. If you are trapping a lactating female, you may want to wait until you have located the kittens and they are old enough to wean. If you wish to foster and tame the kittens in order to get them adopted, they should be taken from the mother at six weeks. If you wait until the kittens are older than six weeks, you will find that the job of taming them gets harder the older they are. Plan to set traps just before or at the cats’ normal feeding time. Dusk is usually the best time to set traps. Don’t trap in the rain or the heat of day without adequate protection for the cat in the trap. 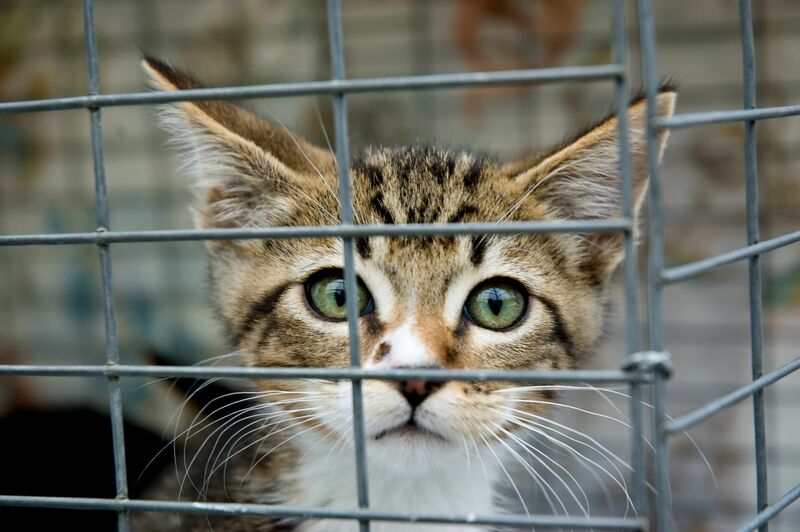 Cats are vulnerable in the traps and could get drenched during storms or suffer from heatstroke in the sun. Please use common sense. Fold sheets of newspaper or absorbent material to line the bottom of the trap, just covering the trip plate. Cats don’t like walking on wire surfaces and the lining material helps to keep their feet from going through the wire bottom when you pick up the trap. Make sure the lining material does not extend beyond the trip plate. Too much lining material can interfere with the trap mechanism or prevent the door from closing properly. Place traps on a level surface in the area where the cats usually feed or have been seen. Cats are less likely to enter the trap if it wobbles. If you’re trapping in a public area, try to place the traps where they will not be noticed by passersby (who may not understand that you are not trying to harm the cats). Bushes are often places where cats hide and provide good camouflage for the trap. To bait the trap, place a paper plate on the ground where you plan to place the rear of the trap. Spoon a small amount of tuna or mackerel onto the paper plate and place the trap on top of the food so the food is as far back in the trap as possible while still not accessible from outside the trap. Press the trap down onto the food so that it squishes up through the wire bottom. The idea is to make the food a little hard to get so that the cat has to go deep into the trap and has to work at getting the food long enough to trip the trap. (Some cats are very good at getting in and out of traps without getting caught. We don’t want to make it too easy for them to get away with that trick. Also, having the food essentially outside of the trap prevents food from becoming stuck inside, and is less messy.) Do not put any food bowls inside the trap. After baiting the trap, open the trap door by pushing the top of the door in and pulling the bottom of the door upward. There is a small hook attached to the right side of the trap top. It hooks onto a tiny metal cylinder on the right side of the door. The hook holds the door in an open position, which also raises the trip plate. When the cat steps on the plate, it will cause the hook to release the door and close the trap. After setting the trap, cover it with a large towel or piece of towel-sized material. Cover the top, sides and back of the trap; fold the material at the front end of the trap to expose the opening. The cover will help to camouflage the trap and serve to calm the cat after he/she is caught. Never leave traps unattended in an unprotected area, but don’t hang around within sight of the cats, or you will scare them off. Remember, the trapped animal is vulnerable. Passersby may release the cat or steal the trap. Wait quietly in a place where you can see the traps without disturbing the cats. If you’re quite a distance away, you can often hear the traps trip and see the cloth cover droop down slightly over the opening. As soon as the intended cat is trapped, completely cover the trap and remove the trap from the area immediately. You might consider putting another trap in the same spot if it seems to be a “hot” one. Be sure to dispose of the food left on the ground when you pick up the trap. You don’t want to litter or give out any freebies to spoil appetites! When you get the captured cat to a quiet area away from the other traps, lift the cover and check for signs that you have the correct animal and not a pet or a previously neutered feral. If you note that you have captured a lactating female, check the area for kittens and remember that this female must be released as soon as she is awake and alert after surgery so she can care for and nurse her kittens. Cover the trap back up as soon as possible. When the trap is uncovered, the cat may panic and hurt herself thrashing around in the trap. If you inadvertently catch a wild animal attracted to the food or a cat you didn’t intend to trap, simply release the animal quietly according to the release procedure below. After you have finished trapping, you will have to hold the cats overnight in a safe, enclosed location until you can take them to the clinic. Place the cats in the prepared protected area. Keep the cats covered and calm, and don’t feed them. They will remain quiet as long as they are covered. Don’t stick fingers in the traps or allow children or pets near the traps. These are wild animals who can scratch and bite. Always get feral kittens checked out by a vet and isolate them from your pets. Make arrangements in advance with a veterinarian for spaying or neutering and vaccinating the cats. Ask about the possibility of discount rates for stray cats, since some vets are willing to offer such reductions as a community service. Tell the vet and staff that they will be dealing with feral cats so they will know what to expect. After spay/neuter surgery, if a cat does not seem to be recovering well, consider having him/her re-checked by a vet before releasing the cat. If the veterinarian finds that the cat has a serious medical problem that you will not be able to treat, you must make a decision, with the advice of the vet, about whether it is safe to release the animal or kinder to euthanize him/her. Untreated abscesses, respiratory infections and a number of other conditions can mean suffering and a slow death for community cats. When a cat is ready for release, return to the area where he/she was captured and release the cat there. Do not relocate the animal because he/she will be disoriented and will most likely die. 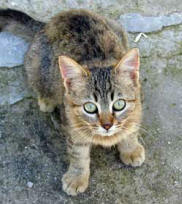 It’s common for cats to drive away new cats who appear in their area. Make sure the spot you pick for release does not encourage the cat to run toward danger (like a busy street) to get away from you. Keep the trap covered until you are ready to release the cat. When you’re ready, simply hold the trap with the door facing away from you and open the door. The cat will probably bolt immediately out of the trap. If that doesn’t happen, tilt the trap so the back is slightly up and tap on the back of the trap to encourage the cat to leave. Never put your hand in the trap! If the cat still will not leave, lift off the rear door and wait out of sight for the animal to leave. After releasing the cats, hose off the traps and disinfect them with bleach. Never store traps in the “set” position (door open); animals may wander into even unbaited traps and starve to death. Shelly Kotter is the national specialist for Best Friends Animal Society’s cat initiatives. She advises communities across the country about humane methods of dealing with cat overpopulation.